Euglenids (Excavata, Discoba, Euglenozoa, Euglenida) is a group of free-living, single-celled flagellates living in the aquatic environments. The uniting and unique morphological feature of euglenids is the presence of a cell covering called the pellicle. The morphology and organization of the pellicle correlate well with the mode of nutrition and cell movement. Euglenids exhibit diverse modes of nutrition, including phagotrophy and photosynthesis. Photosynthetic species (Euglenophyceae) constitute a single subclade within euglenids. Their plastids embedded by three membranes arose as the result of a secondary endosymbiosis between phagotrophic eukaryovorous euglenid and the Pyramimonas-related green alga. Within photosynthetic euglenids three evolutionary lineages can be distinguished. The most basal lineage is formed by one mixotrophic species, Rapaza viridis. Other photosynthetic euglenids are split into two groups: predominantly marine Eutreptiales and freshwater Euglenales. Euglenales are divided into two families: Phacaceae, comprising three monophyletic genera (Discoplastis, Lepocinclis, Phacus) and Euglenaceae with seven monophyletic genera (Euglenaformis, Euglenaria, Colacium, Cryptoglena, Strombomonas, Trachelomonas, Monomorphina) and polyphyletic genus Euglena. For 150 years researchers have been studying Euglena based solely on morphological features what resulted in hundreds of descriptions of new taxa and many artificial intra-generic classification systems. In spite of the progress towards defining Euglena, it still remains polyphyletic and morphologically almost undistinguishable from members of the recently described genus Euglenaria; members of both genera have cells undergoing metaboly (dynamic changes in cell shape), large chloroplasts with pyrenoids and monomorphic paramylon grains. 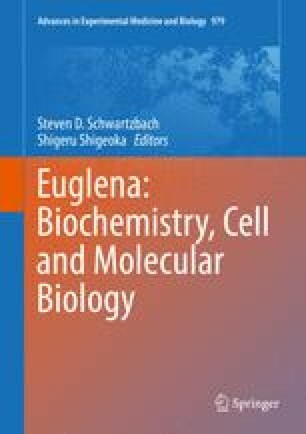 Model organisms Euglena gracilis Klebs, the species of choice for addressing fundamental questions in eukaryotic biochemistry, cell and molecular biology, is a representative of the genus Euglena.